We arrive, as was our habit last year, an hour early for the first Metropolitan Opera broadcast of the season. This year, though, the theater decides to open its doors an hour and a half before the broadcast, so well over 100 people are already in line when we get here. This does not bode well. I’m selfish. I want a seat at the theater. I don’t want to sit in my wheelchair for four hours, neck cricked, staring up at the big screen. And I’m more selfish. I want to sit next to my husband. So I want two of the accessible seats set aside for disabled movie goers and their companions. When they let us in, I see one seat by itself. I tell my husband to grab it. I continue on. A space for a wheelchair, or two, if they’re narrow. Four seats, all taken. Another space. Four more seats. You and your friend sit in the middle two, leaving the ones on the ends vacant. I ask you if you are saving all of them. You say no. I ask you if you’d be willing to move over one, so that my husband and I could sit together. You hesitate. You pick up your coat, smooth it with your hands, put it down on the same seat. You say, “We can only sit in these middle ones, so we’ll move only if you’re willing to explain why we’re in those.” I look at the middle ones, and at the ones on the end. The ones on the end have the wheelchair guy stenciled on them; the ones in the middle don’t. I realize that you genuinely think that it’s ok to sit in the middle ones, the ones without the stencil. You think this even though we are surrounded by many dozens of frail elderly people using canes and walkers; elderly people carefully climbing the steep stadium stairs to other seats, so they won’t take the ones intended for the disabled. So I go back to my husband, and I sit in my wheelchair in the space next to his seat, until he notices that my neck and back hurt, and he offers to switch. The opera is very long, and I’m crying, but not because Tosca has betrayed Cavaradossi and Angelotti. What a despicably petty excuse for a person. Katja..Going to the MetHD performances, the trajedy is only supposed to be on the screen, not in front of it. Our season tickets are seat specific…sorry yours were not. I hope you were still able to enjoy the beauty of the music. How genuinely awful of her! That really makes me mad someone would be that much of a jerk to you. Yes, but from her point of view, I was the awful one. I was trying to get her to switch from doing something she knew was Right (sitting in the seats with no wheelchair guy on them) to something she knew was Wrong (sitting in one of the end seats), thereby exposing her to the risk that the enforcers would come boot her out and make her trek up to the top of the auditorium (or worse yet, down to one of the three empty rows right in front). She’d lose her great seats! 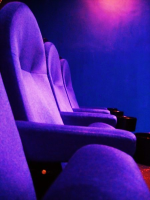 Of course, there are no enforcers – when was the last time you saw an employee of a movie theater actually ask anyone to move out of an accessible seat? I am in the middle of writing a blog post on how the idea of rudeness is deflected onto us and am mentioning what happened to you as an example. I know what you mean–at one movie theater, I couldn’t navigate through the rope maze, and so I had to wait next to the theater. Though we were waiting in line early, we were let in last and were glad to get seats at all because of it.